There just seems to be something special about wine with bubbles in it. Be it at a wedding or on New Year's Eve - opening a bottle of sparkling wine marks a special occasion. Those effervescent bubbles seem to have a way of bringing out smiles, and its reputation of making one "giddy" far quicker than expected is well known (and memories of following day headaches solidify the tender remembrances). Perhaps we should begin by defining a few things. First off, a bottle of sparkling wine can technically only be called "champagne" if it is grown and produced in the Champagne region of France, similar to brandy from Cognac or port from Portugal. Therefore, when discussing "the bubbly", we should stick with referring to it as sparkling wine on a generalized basis (this is also a public safety announcement as French regulatory agents take this matter extremely serious). Secondly, a sparkling wine is defined as a wine with significant levels of carbon dioxide within it, which provides the bubbles. It does make one wonder though how anyone ever perceived that bubbles in wine would be a good thing…I mean can you imagine having your glass of Cabernet Sauvignon fizzing with bubbles? No, no you cannot, which is exactly what people thought centuries ago when they noticed that occasionally their wine bottles had carbonation in them. You likely recognize the name Dom Perignon and associate him with champagne/sparkling wine. In fact, the Dom Perignon champagne label may arguably be more recognized than any other wine bottle on the planet. And, although it is appropriate for Monsieur Perignon to receive credit for promoting quality sparkling wine, he by no means invented the process from scratch; his discovery of the positive attributes of carbonation in wine was actually accidental. Perignon was tasked originally with figuring out how to rid the situation from certain bottles occasionally having bubbles in them! Now, let's get into the vineyards. It may not be surprising that the most common varietal for white sparkling wine production is Chardonnay, but it may be that the second is most likely Pinot Noir. Grapes used for sparkling wine production tend to be best when sourced from cooler growing climates, which explains why the Champagne region, far in the northeast of France, is the ancestral home of sparkling wines (and this is also why our own Monterey County produces some fantastic sparklers as well!). Sparkling wine grapes are harvested early in order to capture high acidity levels and to avoid high sugar levels; avoiding tannins is another goal. To deter this as much as possible, extra care is taken during the harvest to avoid splitting of the berries, and grapes destined for sparkling wine production are pressed as soon as possible. Moving on, let's venture into the winemaking process. White wine grapes are the most popular for use in making sparkling wines, and it is even possible for winemakers to make varietal sparklers, such as blanc de blancs (white of whites), which is 100% Chardonnay. However, the vast majority of sparkling wines produced are blends of several varietals, vineyards, and vintages - this is why it is not uncommon at all to see non-vintage sparkling wines. Red wine grapes can be used for white sparkling production (as the juice is initially clear without prolonged exposure to grape skins), and these sparklers area known as blanc de noirs (white of blacks). Rosé sparkling wines are quite popular, especially in Spain and Portugal. Although rare, there are also red sparklers. For all sparkling wines, primary fermentation occurs in the winemaking process, just as it does with still wine production. The alteration in the process that distinguishes sparkling production occurs with the introduction of a secondary fermentation (which can occur naturally on its own, explaining why Perignon began experimenting). This secondary fermentation is conducted in various methods explained below, but a by-product is the creation of carbon dioxide captured in the wine. Estimates of the amount of bubbles one bottle of sparkling can produce ranges from 50 to 250 million…that's a lot of bubbles! As for the different methods to encourage the secondary fermentation, the most well known is the méthode champenoise, sometimes referred to as the "traditional" method. In this method, a base blend wine (cuvée) is bottled with sugar and yeast, with the sugar providing a food source for the yeast, eventually releasing carbon dioxide into the wine. The dead yeast cells (called "lees") are removed from the wine and voila! Another method used to produce sparkling wines is the method charmant. This method uses stainless steel tanks that are pressurized, which stimulates the process of the yeast and sugar interaction, and then the wine is bottled (i.e. basically it's a faster process than the two previously described methods). The last method used is carbon injection, which doesn't involve a secondary fermentation process, and instead consists of injecting carbon dioxide gas directly into the wine… soda pop comes to mind. As you can imagine, the carbon injection method is used to produce the cheapest bottles of sparklers. Brut or Doux: how sweet do you like your sparkling wines? The amount of sugar introduced for the secondary fermentation process will ultimately determine the level of sweetness in a sparkling wine. Brut Natural is the driest, although fairly limited in production. Extra Brut is the more common driest style of sparkling wine you will encounter, followed by Brut, which is arguably the most popular of all styles. Extra Dry (also called Extra Sec) is slightly less dry than Brut, followed by Sec. The two sweetest styles of sparkling wine are Demi-Sec and then Doux. Sweet or dry in style, sparkling wines are produced around the world. 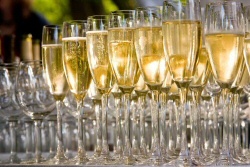 California and France are major producers; the Aussies have a Shiraz sparkler; the Spanish produce Cava; the Portuguese have Espumante; the Germans have Sekt; the South Africans produce Cap Classique; and the Italians have various versions, with their generic term for sparkling wine being Spumante. So, there you have a brief overview of this intriguing style of wine, and we hope that you will savor your glasses of bubbly. One last point is that although it may be fun to open a bottle of sparkling wine by "popping" the cork out and projecting a burst of fizz…keep in mind that by doing this you are doing your bottle a great disservice. Not only are you wasting wine (nothing less than a crime on its own), but you'll be releasing so much carbon dioxide that you will not be able to fully appreciate the bubbling in your glass!